To start off my new blog, I'll post my required reading journal. The first book is by my current mentor in the Seton Hill WPF Program. You know what he would say to that? And, just like anything else I make from a recipe, it never turns out exactly like it’s supposed to. Maybe that’s why the title of Chapter 15 is Another Name for Writing Is Rewriting. Tom reminds you throughout the book that it’s more important to get everything down first, then go over it with the red pen later. The rewrite is also when he suggests to liven up your language with interesting verbs, master the use of simile and metaphor (like my recipe from above), get rid of the cliches, and pay attention to syntax. Oh, and run the spellcheck. But, I’m getting ahead of myself and almost forgot about my two favorite chapters; Dialogue and Characters. Since my own work is very character-driven, it’s obvious why I’m also drawn to dialogue. Like Tom says, it’s a good, subtle way to include backstory, set the mood, create tension, show the character’s background, and make each character sound like an individual. This last one is tougher than it sounds. Much of a character’s dialogue style will depend upon which archetype he or she most closely resembles. In my own writing, I have a large cast, so sometimes the archetypes overlap. For example, there is one main protagonist and antagonist, but a few others serve to fill those roles throughout the work as well. My skeptic and conscience guy are one in the same, but my emotionalist and her opposite, the rationalist seem content to stay within those limits. 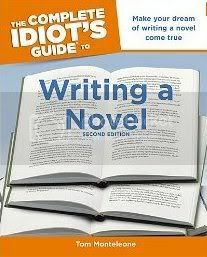 Now, as useful as the first part of Tom’s book is, I have to tell you, I can’t wait until I have to reference chapters 18-20. Those are the ones on Marketing, Publicity, and Publishing. Maybe next year.